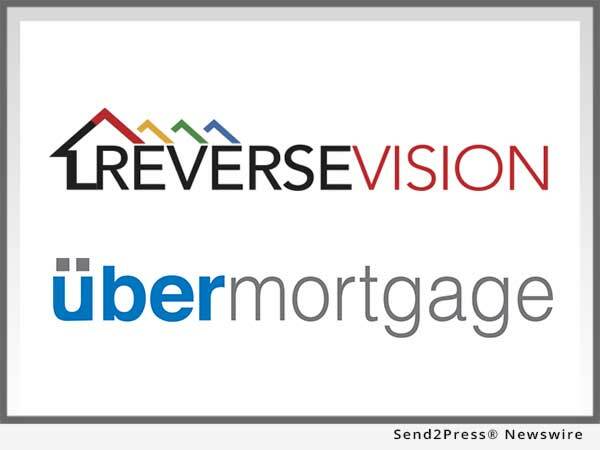 SAN DIEGO, Calif., June 13, 2017 (SEND2PRESS NEWSWIRE) — ReverseVision, the leading technology provider for the reverse mortgage industry, has formed a partnership with übermortgage Inc. to support the budding lender’s increasing demand for home-equity conversion mortgages (HECMs) with its RV Exchange (RVX) loan origination technology. Emerging this year as a wholly-owned subsidiary of South Pacific Financial Corp., übermortgage describes itself as a consumer-direct lender that combines the convenience of call center and online loan shopping with a relationship-oriented customer service approach to meet the evolving needs of today’s consumers. According to CEO John Johnston, the FHA-insured HECM has been part of übermortgage’s product plan since the company’s outset. An experienced traditional lender, Johnston knew that getting up to date on the latest changes to the HECM program was an essential first step. He signed up for training through RV University (RVU) and completed a live, three-day training course designed to springboard the success of companies like übermortgage that have yet to establish their own HECM training. The course also gives attendees the opportunity to test-drive RVX. ReverseVision’s RVX serves as a centralized exchange that connects all participants in the lifecycle of a HECM loan and allows them to log in to a single system to share documents and information for each part of the loan process. The system encompasses everything from point-of-sale, processing and underwriting to funding, post-closing and secondary marketing. For Johnston, choosing RVX was not difficult. ReverseVision, Inc. is the leading software and technology provider for the reverse mortgage industry, offering products and services focused exclusively on the home-equity conversion mortgage (HECM) and related reverse mortgage programs. With nearly 10,000 active users, ReverseVision technology supports more reverse mortgage transactions than all other systems combined. The company’s comprehensive product suite also includes reverse mortgage sales and education tools and a dedicated professional services team. ReverseVision partners with some of the finest and fastest-growing banks, credit unions and lending organizations in the United States to provide its reverse mortgage technology to brokers, correspondents, lenders and investors. A 2017 HousingWire TECH100™ company, ReverseVision has also been recognized in Deloitte’s Technology Fast 500™ listing. ReverseVision’s annual user conference, the only event of its kind in the industry, brings together more than 200 lenders, vendors and educators each year to advance reverse mortgage lending. The company continues to build on its technology’s pioneering capabilities with frequent enhancements aimed at boosting users’ reverse mortgage volume, workflow efficiency and data analysis capabilities. A wholly-owned subsidiary of South Pacific Financial Corp., übermortgage Inc. is a new type of mortgage company that leverages self-service technologies to address the needs of today’s homebuyers and homeowners by providing a streamlined, do-it-yourself, low-cost and environmentally friendly mortgage experience. "HECMs are an important opportunity for ubermortgage to create value for our customers," said Johnston. "We have a fiduciary responsibility to offer all borrowers, including those age 62 and older, flexible loan options that meet their needs."